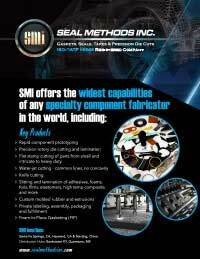 With our strong 30-year history as a premier manufacturer of gaskets, seals, tapes and precision die cut components, Seal Methods, Inc. is a key supplier of these products to all major industrial markets. Our state of the art manufacturing facilities encompass roughly 325,000 sf which house automated, high-speed rotary and flat-bed die-cutting equipment, numerous converting lines, as well as a Class 100 cleanroom. We also have reciprocating knife cutting, laser, and waterjet cutting equipment to support short run production and rapid prototyping. Our robust manufacturing and quality systems emphasize continuous improvement, environmental stewardship, and are ISO/IATF 16949 registered. We manufacture a full spectrum of specialty components, from simple foam or felt rolls or sheets to intricate multi-layer, precision die-cuts. Our custom designed shapes are used in everything from petrochemical and heavy equipment to general purpose custom components found in appliances, aircraft, sporting equipment, retail items, toys, and more. We are more than just a manufacturer – we have a remarkably talented staff with a deep background in materials sciences who work closely with your in-house engineering teams to improve the efficiency, longevity, and production costs of your products. In the appliance market, we help solve issues related to thermal and electrical insulation, EMI/RFI shielding, radiant heating or cooling, component attachment, and sealing. We have partnered with clients in the renewable energy markets to develop several new key technology advancements in the area of solar and wind power generation. Wire manufacturers around the globe take advantage of our innovative wiping system that promotes quality and uniformity in their galvanized products. These are just a few examples of the breadth and depth of our capabilities. We supply finished components made from foams, solid elastomer felts, cork, gasket materials, adhesives, and phenolics as well as plastic films, metal foils, and many other specialty materials. Our long-term relationships with leading raw material manufacturers allow us access to the most cutting edge products at competitive pricing. As one of the most capable and competent manufacturers in the world, we are positioned to meet your full end-to-end production requirements. Our turnkey services include custom assembly, kitting, and private label or bulk packaging. When you work with us, you can expect prompt service from a knowledgeable staff. For more information, contact us today.